I love the daisies. Thanks for sharing the pattern. I am definitely going to remember to share your site tomorrow with my crochet group. Thanks for the daisies pattern. I love it! @Glo ~ thank you, that's so lovely! 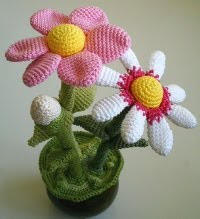 I crocheted the flowers without the pot. I really like them. I think I'll make brown-eyed susans from that pattern also. Send me a pic when you're done. Your patterns are just wonderfully done. Thanks YarnYokel, but I can't accept the compliment - most of these patterns aren't mine. can u tell me : what's esc2 means?? I think the "e" is a typo on the part of the designer, Diana Prince. "sc" is the abbreviation used in patterns for the single crochet stitch. "2sc" simply means that you need to do two single crochet stitches in a row.